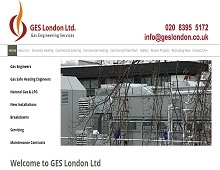 GES London Ltd are gas engineering specialists located in Carshalton, London. For over 20 years they have been offering both commercial heating services in London and domestic heating services in London & the South East. From commercial pipe work and gas engineering for commercial catering to domestic heating and gas engineer services, GES London provide a broad range of heating services from their Carshalton base. GES London Ltd are Gas Safe Registered and are an OFTEC registered heating business covering London and Surrey. You can browse their recent projects to see how they have helped restaurants, hotels, colleges and hospitals. If you are looking for a gas safe heating engineer in Carshalton or commercial catering gas engineers in London, contact GES London Ltd today for a free quotation.